Trace Control – For additional information, refer to “Active Trace Control” in “Starting and Operating” section of this manual. Engine Brake – For additional information, refer to “Active Engine Brake” in “Starting and Operating” section of this manual. For additional information on how to set the clock, refer to the “Monitor, climate, audio, phone and voice recognition systems” section of this manual or the separate Navigation Owner’s Manual. The meter settings allows the customer to choose from the various meter selections. The meter settings can be changed using the , , and the ENTER buttons. The items that display can be enabled/disabled when the ignition switch is placed in the ON position. To change the items that display. Trip Computer – For additional information, refer to “Trip Computer” in this section. The color of the vehicle that displays in the vehicle information display when the ignition switch is placed in the ON position can be changed. The following information can be enabled/disabled to display in the vehicle information display when the ignition switch is placed in the ON position. From the “Main Menu Selection” select “ECO Mode Settings” to display the information when the ignition switch is placed in the ON position. Select “Display” then ”On” or “Off” to display “Pedal (if so equipped)” or “Inst.FE (Instant Fuel Economy)” in the vehicle information display when the ignition switch is placed in the ON position. From the “Main Menu Selection” select “ECO Drive Report” to display the information when the ignition switch is placed in the ON position. Select “Display” then “On” or “Off” to display the information when the ignition switch is placed in the ON position. The ECO Drive Report is displayed when the ignition switch is in the OFF position. The welcome screen display can be turned ON/OFF to display when the ignition switch is placed in the ACC (if so equipped) or ON position. Use the buttons to select “Settings”, and press ENTER. Select “Welcome Effects” using the buttons and press ENTER to turn this function ON or OFF. The trip computer can be enabled/disabled to display in the vehicle information display when the ignition switch is placed in the ON position. From the “Main Menu Selection” select “Trip Computer” to display in the vehicle information display when the ignition is placed in the ON position. The current fuel consumption mode shows the current fuel consumption. The average fuel consumption mode shows the average fuel consumption since the last reset. Resetting is done by pushing the button for longer than one second. The display is updated every 30 seconds. At about the first 1/3 mile (500 m) after a reset, the display shows “_ _”. The average speed mode shows the average vehicle speed since the last reset. Resetting is done by pushing the button for longer than one second. The elapsed time mode shows the time since the last reset. Resetting is done by pushing the button for longer than one second. The trip odometer mode shows the total distance the vehicle has been driven since the last reset. The display is updated approximately every 30 seconds. The dte mode includes a low range warning feature. If the fuel level is low, the warning is displayed on the screen. When the fuel level drops even lower, the dte display wil change to “_ _”. If the amount of fuel added is small, the display just before the ignition switch is pushed to the OFF position may continue to be displayed. When the route guidance is set in the navigation system, this item shows the navigation route information. The audio mode shows the status of audio information. The driving aids mode shows the operating condition for the following systems. For additional information, refer to “Blind Spot Warning (BSW) system /Lane Departure Warning (LDW) system”and “Forward CollisionWarning (FCW) system ” in “Starting and diving” section of this manual. The tire pressure mode shows the pressure of all four tires while the vehicle is driven. The axle between the tires will also display the recommended tire pressure. When the “Tire Pressure Low Add Air” or “Flat Tire Visit Dealer” (if so equipped) warning appears, the display can be switched to the tire pressure mode by pushing the button. The tire pressure unit can be changed in the TPMS setting under the Settings menu on the Vehicle Information Display. For additional information, refer to “Vehicle Information Display” in this section. When the Active Trace Control, Active Engine Brake, or the Active Ride Control is operated, it shows the operating condition. It also shows operating condition of hill start assist or the hill descent control. For additional information, refer to “Active Trace Control, Active Engine Brake, Active Ride Control, hill start assist or the hill descent control” in “Starting and Driving” section of this manual. The vehicle settings allows the customer to change settings for interior lights, turn signals, intelligent key settings, unlock settings and other vehicle settings. The vehicle settings can be changed using the , , and the ENTER buttons. The welcome light can be set to be ON or OFF. From the Vehicle Settings menu, select “Welcome Light”. Use the ENTER button to turn this feature ON or OFF. The interior lights can be set to be ON or OFF if any door is unlocked. From the Vehicle Settings menu, select “Auto Room Light”. Use the ENTER button to turn this feature ON or OFF. The light sensitivity can be set to illuminate earlier based on the brightness outside the vehicle. From the Vehicle Settings menu, select “Light Sensitivity”. Use the ENTER button to change the sensitivity. The duration of the automatic headlights can be changed from 0 to 180 seconds. From the Vehicle Settings menu, select “Light Off Delay”. Use the ENTER button to change the duration. The 3 flash pass can be set to be ON or OFF. From the Vehicle Settings menu, select “3 Flash Pass”. Use the ENTER button to turn this feature ON or OFF. When this item is turned on, the request switch on the door is activated. From the Vehicle Settings menu, select “I-Key Door Unlock”. Use the ENTER button to activate this function. When this item is turned on, only the driver’s door is unlocked first after the door unlock operation. Settings menu, select “Selective Unlock”. Use the ENTER button to activate this function. When the answer back horn is on, the horn will chirp and the hazard indicators will flash once when locking the vehicle with the Intelligent Key. The speed dependent feature can be set to be ON or OFF. From the Vehicle Settings menu, select “Speed Dependent”. Use the ENTER button to turn this feature ON or OFF. The reverse link feature can be set to be ON or OFF. From the Vehicle Settings menu, select “Reverse Link”. Use the ENTER button to turn this feature ON or OFF. The drip wipe feature can be set to be ON or OFF. From the Vehicle Settings menu, select “Drip Wipe”. Use the ENTER button to turn this feature ON or OFF. Use the button until “Settings” is selected. Select “Maintenance” using the button and press ENTER. This indicator appears when the customer set distance is reached for replacing tires. You can set or reset the distance for replacing tires. The tire replacement indicator is not a substitute for regular tire checks, including tire pressure checks. For additional information, refer to “Changing Wheels and Tires” in “Maintenance & Do- It- Yourself” section of this manual. Many factors including tire inflation, alignment, driving habits and road conditions affect tire wear and when tires should be replaced. Setting the tire replacement indicator for a certain driving distance does not mean your tires will last that long. Use the tire replacement indicator as a guide only and always perform regular tire checks. Failure to perform regular tire checks, including tire pressure checks could result in tire failure. Serious vehicle damage could occur and may lead to a collision, which could result in serious personal injury or death. 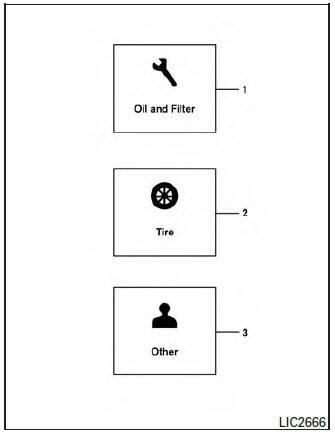 This indicator appears when the customer set distance is reached for checking or replacing maintenance items other than the engine oil, oil filter and tires. Other maintenance items can include such things as air filter or tire rotation. The distance for checking or replacing the items can be set or reset. This setting allows the customer to set alarms for outside temperature and a timer alert. Use the button until “Settings” is selected, and press ENTER. Select “Alarm” using the button and press ENTER. This setting allows the customer to enable/disable the alert for low outside temperature in the vehicle information display. Use the button to select “Outside Temperature”. Press the ENTER button to turn ON/OFF the outside temperature in the vehicle information display. This setting allows the driver to set an alert to notify a set time has been reached. Use the button to select “Timer Alert”. To change the timer amount, use the button and the ENTER button to save the selected time amount. This setting allows the customer to enable/disable the alert for navigation in the vehicle information display. Use the buttons to select “Navigation”. Press the ENTER button to turn ON/OFF the alert. Use the buttons to select “Phone”. Use the buttons to select “Mail”. Use the , , and the ENTER buttons to select and change the units of the vehicle information display. The units of the navigation screen can be changed independently of the vehicle information display. For vehicles equipped with Navigation, refer to “How to use the button” in the “Monitor, climate, audio, phone and voice recognition systems” section of this manual. Use the and the ENTER buttons to select and change the unit. Use the ENTER button to toggle choices. Use the , , and the ENTER buttons to select and change the language of the vehicle information display. The language of the center display/navigation can be changed independently of the vehicle information display. For vehicles not equipped with Navigation refer to “ENTER/SETTING button:” and vehicles equipped with Navigation refer to “How to use the button” in the “Monitor, climate, audio, phone and voice recognition systems” section of this manual. Use the buttons to select “Settings”, and press the ENTER button. Select “Factory Reset” using the buttons and press the ENTER button.